In love with your bracelet! oh I love Kenzo * U * ! Lovely outfit ! Beautiful sweater dear but have you lost some wight recently? Well I just love that sweater!! Need it.. love your blog!! How exciting, another exhibition!! Hope you'll show us some of the photos. I know what you mean about moving, I've been doing the same thing this week and it's been hectic. Totally in love with your bracelet and pants. Me encanta la sudadera, es divina! Dopada mi se kombinacija tih boja. Duks je divan! looking amazing.. and this sort to dark photos are even cuter... they give a whole sort of new point of view to all .... overall it's a nice effect ..
Amazing outfit! Love the top! 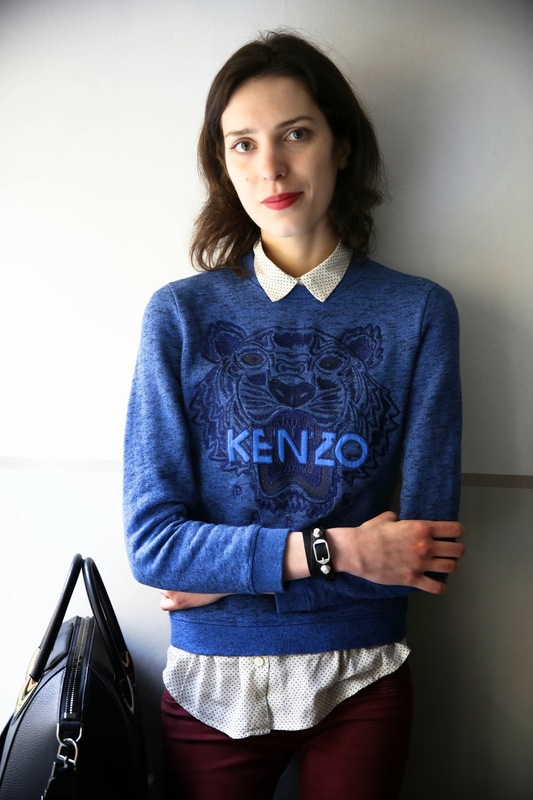 I LOVE your Kenzo jumper. I saw a similar jumper the other day on the Saks 5th ave window on my walk home from work. The one I saw was gray, but I think I like this blue one you're wearing much more. Love this outfit! The color combination is great and I love the dot detail! WOW! Great post my dear! Thanks for visit my blog! I really appreciate it! You look very pretty and natural. I love you effortless outfit, easy yet chic! Those photographs are adorable! Oh that bag is pure heaven! I'm so in love with it! I am so glad that you are staying positive and thinking positive because great things are just ahead! Love the burgundy with the blue, great combination.